Eduard Hanslick was the son of the music teacher Joseph Adolph Hanslick. He studied music with Timasek in Prague and law at the University of Prague. He started writing music reviews for Wiener Musik-Zeitung and later Neue Friede Presse, where he was the music critic until he retired. In 1845 he first met Richard Wagner, who invited him to Dresden to hear "Tannhäuser". In Dresden he met Robert Schumann. In 1854 he published "On the Beautiful in Music". By this time he preferred Mozart, Beethoven and Schumann above Liszt and Wagner and he wrote an unfavourable review of the performance of "Lohengrin" in Vienna. At the house of Joseph Standhartner a memorable reading of Wagner's "Der Meistersinger" took place on 23 Nov 1862. For this occasion Wagner had renamed the Beckmesser character to Hanslick. Hanslick was present and immediately left the room. In 1869 Wagner wrote that Hanslick's criticism was Jewish and anti-German. In 1870 Hanslick became professor for Ästhetik und Geschichte der Musik at the University of Vienna and he also worked for the Austrian Ministry of Culture. After he retired he kept writing articles on music until he died in 1904 in Baden. 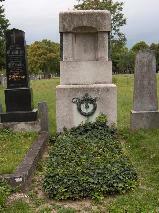 The grave of Eduard Hanslick at the Zentralfriedhof, Vienna.